General Electric (GE), the American multinational conglomerate corporation has announced the launch of their Digital Technology Centre in Bangalore. Jim Fowler, Global Chief Information Officer (CIO) will launch the new centre on November 30, 2016 and will be located at the Prestige Shantiniketan at Whitefield. The on-going BengaluruITE.biz is currently happening at the Bangalore Palace grounds and has attracted a large number of global corporates. The new centre will be GE's game plan to invest $1 billion globally in digital technologies, as the company is gearing up for digital transformation with Predix Platform. "The next industrial revolution is about the connection of enterprise data and machine data and models that predict future outcomes," he said. GE is expected to hire over 1,000 techies over the next three years. “We will focus our operations on Internet of Things (IoT) and industrial internet,” he adds. GE has made this city its second home with the John F. Welch Technology Centre (JFWTC), named after the former CEO of GE, located at in Whitefield, Bangalore. The JFWTC is General Electric's (GE) first and largest integrated, multidisciplinary research and development center outside the US. The team has more than 5,000 engineers and scientists working at the JFWTC Bangalore. Priyank Kharge, Minister for IT, BT and Tourism, earlier speaking to the media highlighted the fact that this year’s ITE.biz is expected to be of a bigger scale and scope compared to the past with more global players taking part actively. 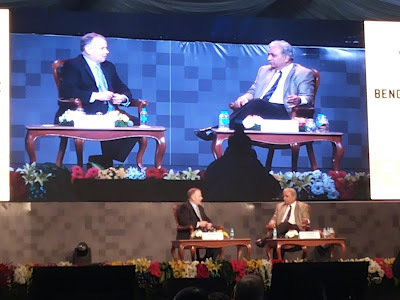 He stressed that our endeavour is to bring all stakeholders-policy makers, Industry and academia together to celebrate the wonderful technology ecosystem that Karnataka has, and to strive to retain our position of leadership through strategic investment of resources on people, places and technologies.